You can find Monique here and here on Ravelry. Old knitting books, shapes of the shawl-to-be, constructions, stitch patterns or repeats. I work as a mail delivery person ("mailman") and while I’m walking, I think of stitch patterns, repeats and shapes. Or I make a sketch and try to come as close as I can knitting that. Yes, I do look at other designers. But more often than not to see what has already been done. So I don’t come up with something that has just been designed by someone else. Sometimes I look to see what colours are hot (or not) and see how they have styled it to sell. When I see something I like, I always work hard to give my own interpretation of it. Or give it a twist with shaping. For instance: I had seen the Cockle Shell pattern, but only in a rectangle version. I thought: I could be the first to give it in a triangular version! That meant that it had to be a shawl that needed to be designed bottom-up. Which presented a whole set of challenges and pattern combinations. It’s my best selling pattern so far. I see myself as a pretty advanced lace knitter. I love open work (patterning on both sides). But that corner of the (lace) knitter market is very small. So, my designs in that section sell only a few copies (10 on average). Technically, for me, it is dumbing down to design something many people can knit. But it’s not as easy as one might think. You have to make sure the pattern gives clear instructions, gives a clean design of which many people will think: “Hey, I can do that!”. With all my designs, I haven’t managed to land one in the Top 20 of Ravelry. On the other hand; with Ravelry being over 5 million users, the number of simple lace patterns is overwhelming. It’s really hard to stand out from the rest with a simple design among hundreds of others, released every day. Potential buyers can be picky. Nowadays, new designers give out pattern for free, temporarily, to make the Top 20. I don’t do that. I’m working hard to develop a design, I have a registered business, I deserve to get paid. No matter how skilled you need to be to knit it. I am very fortunate to have people wanting to test for my designs when I call out for them. I have the luxury to even have a choice in this. At first I had around five test knitters for one project. Life happens, so some dropped out. For the next design, a rather large project, I have one main test knitter and two additional. That is because I knit the larger size myself and the main test knitter is testing the smaller size, so the additional test knitters have a correct version to work from. In addition to all that: I often have test knitters in two languages; Dutch and English. IN ALL CASES: I knit the design myself. Sometimes more than once. Why deny myself the pleasure of a new project with sometimes a brand new yarn to experiment with? No. I decided to do only designs, workshops, lectures and sell knitting belts. I don’t have yarns or sell needles. This way, I can keep the business close to myself, I don’t have to outsource anything. I only regret not having done a survey about the customer I intend to reach. On the other hand, my business has been thriving by word of mouth. Let me think… Yes and no. When I run into business trouble, I can always ask my dad. My husband keeps my head on my shoulders. Also my good friend Angelique. She had a web shop and helped out with tips and customer service. But all knit-decisions I make myself. For better or for worse. Yes, I think so. 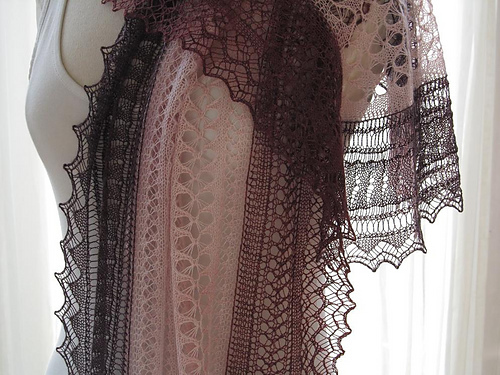 When I started knitting lace, I wanted to knit shawls (pretty things) to make people happy with something hand made. 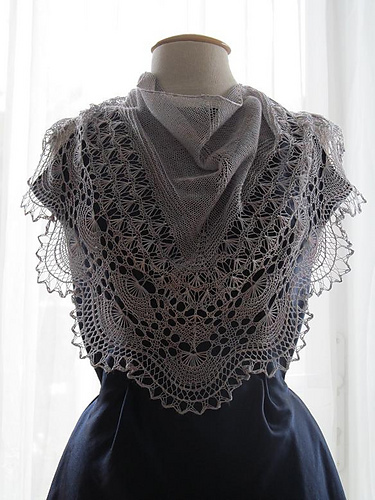 Now that I’ve learned to knit finer lace, there is a part of the history that comes with that. I’m trying to pass that on, so that it doesn’t get lost. That wasn’t why I got into this, but it is now. Thanks to knitting, I’ve met a lot of very nice people, I’ve learned how to run a business and pushing myself to get better at it. I don’t make enough to pay a good one. My test knitters help me out with things I have overlooked. Sometimes a (knitter) friend will help with spelling. Oh… I don’t. When things need to be done, they get done. I am somewhat famous for making the deadline. I’ve missed only one out of 79. I have three teenagers and a husband that is away from home a lot. I am a night person, so knitting gets done in the evenings and nights. Business gets done in the morning, delivering mail in the afternoon, and knitting after dinner. When the children do their hobbies in the weekend, I get more knitting done. Downside; I don’t get out much. Now better than in the beginning. I try to see what they mean, check if it is so and then make notes. When I create a new design, I will make an effort to implement that. I have my own style of describing and designing; I can always improve on my instruction-writing-skills. To be honest, I don’t get criticism that much, anymore. I can’t support myself with knitting. At first, I had a lot of commissions. I was able to go to Shetland Wool Week from that in 2012. 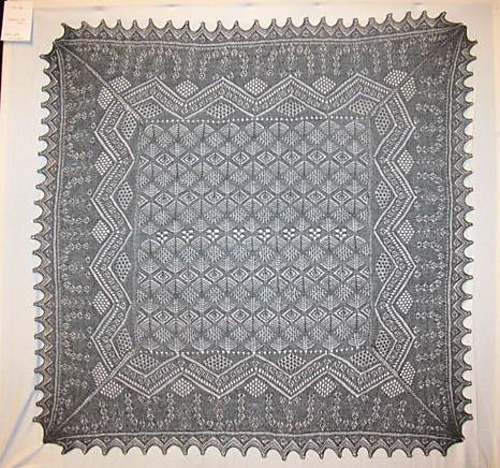 The crisis hit, I had been giving workshops (as many others have) and people can knit their own shawls now. So, income has been transferred to giving workshops and making designs. My record selling pattern has sold 150 copies over the past three years. I average 10 - 12 sold patterns per design. Compared to the amount of work a design takes, that is not enough to support myself as a business. Make sure you have your client at heart, what do you have to offer that they would like to see and want to wear. I’ve noticed that personality comes into running a business too. It’s the way you present yourself, your designs and your skills. That is makes your designs stand out from the rest. A business ethic is also very important; correspondence (don’t keep the client waiting for an answer to their troubles) and correct administration (on both paper and digital) is crucial. Keep track of what you’ve done and have planned. The cliché is true: keep it close to ‘home’. Do what you know, and know what you do. Believe in yourself, set a goal and work towards that. Reached your goal? Make a new one! Who knows? I’ve been lucky to have made designs for some very kind people, shops and brands. I hope to be able to keep doing that. 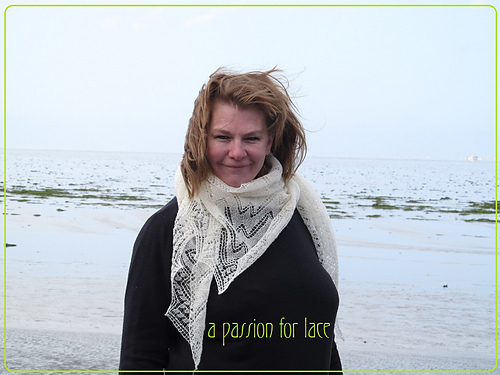 Lace can be for special occasions but also for every day. I want to tell knitters to invest in good quality material to work with. 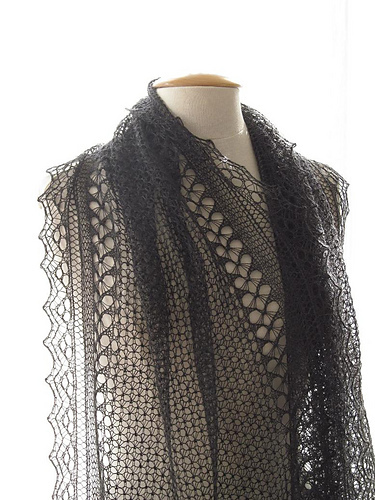 All that hard work (knitting lace patterns) in a luxury yarn, will make you want to wear it every day. My specialty is Shetland Lace. The finer, the better. 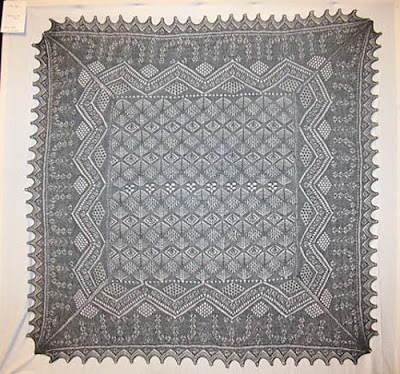 I (can) recreate shawls from pictures I took or have seen at the Shetland Museum and Archives website. It’s like reaching through the glass of the Museum (Unst, of course) and touching it, recreating it, wearing it. Now that I’ve learned how to spin, it gets even better! I can spin the yarn for my own design! 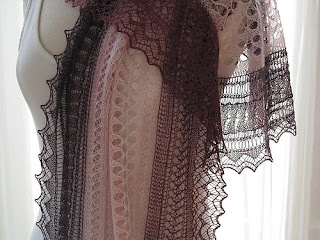 I truly hope knitters will get interested in the finer lace designs. With my passion for lace, I hope that knitters will find their way to my design to enjoy making them. It's great you've given me a spot on your blog. Thank you very much, Robin!